Size of this PNG preview of this SVG file: 600 × 600 pixels. Other resolutions: 240 × 240 pixels | 480 × 480 pixels | 768 × 768 pixels | 1,024 × 1,024 pixels | 805 × 805 pixels. 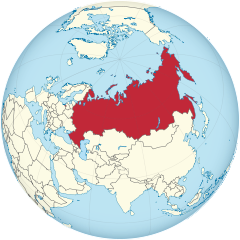 This vector image includes elements that have been taken or adapted from this: Russian Federation (orthographic projection).svg (by Ssolbergj). This page was last edited on 10 April 2015, at 15:02.